I just picked up the Pandora Px5 guitar effects processor and amp modeler. This is one cool little piece of gear! The sound quality on these things is truly unreal... I would easily put it up there with a Pod XT for recording. These are great for practicing and/or quick recordings of scratch tracks or musical ideas. If handled properly even final guitar parts could conceivably be done with it. 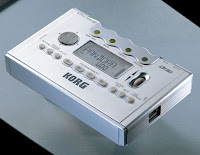 Click the link below for a quick demo I did using only the Korg Pandora Px5 for drums, rhythm guitar tones and lead. I used the free Ableton software included in the box to record everything. Unlike previous versions you can now plug in to your computer via USB for updates and also to create and organize patches, drum loop chains and more. It is a very cool little device that is not much bigger than a cellphone! I highly recommend one of these for someone looking for a great practice tool that can also double as a piece of serious recording gear. Were these factory patches that you used on this recording, or custom patches? If they were the standard patches, which did you use, and what kind of guitar were you using? These were standard patches, and I think I tweaked the lead one a little bit. I am not sure now which one I tweaked, but it was a standard patch that I modified. Guitar was a cheap Music Man Sub 1 that I bought used for $200, all original (including pickups). Les Paul Boutique Pickup Shootout! !